Potato flesh consists of densely packed starch cells -- it's what gives them firmness when uncooked. 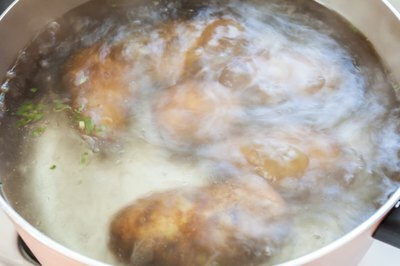 To cook, the moisture must first turn to steam, which swells the starch cells. After swelling, the cells separate and the steam dissipates, leaving a fluffy, dry texture behind after about one hour. Regular ovens, which cook with heated air, aren't efficient at cooking starch -- that's one of the reasons using a convection fan cuts cooking time by about 15 percent. 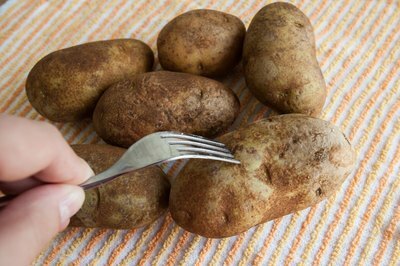 When you want to bake potatoes fast, partially cook them using moist heat and finish them in the oven. Partial boiling, or par boiling, can cut potato cooking time by almost half -- the quickest of the partial-cooking methods. Heat the oven to 450 degrees Fahrenheit. Poke the potatoes all over with a fork and add them to a pot of salty cold water -- starting potatoes in hot water creates a mealy texture. Boil the potatoes for 10 to 12 minutes -- 12 for large potatoes, 10 for medium -- and drain them in a colander. 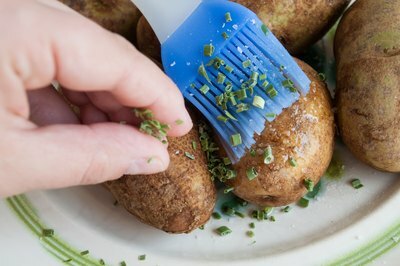 Next, use tongs to transfer the hot potatoes to a sheet pan and brush them liberally with olive oil or butter. Bake until the skin sizzles and browns, about 10 minutes. Microwaving potatoes, then oven-searing them, produces a drier interior than boiling and cooks them in about the same amount of time. Heat the oven to 450 F. Poke the potatoes liberally with a fork and coat them with olive oil. Season the potatoes to taste and microwave them on high for 3 to 5 minutes -- 3 for medium potatoes, 5 for large -- then turn them over and microwave for another 3 to 5 minutes. Using tongs, transfer the potatoes to a shallow dish or sheet pan and bake them in the oven until browned, about 10 to 15 minutes. Small varieties of potatoes give you flexible cooking times and the chance to put some color and creativity on the plate. 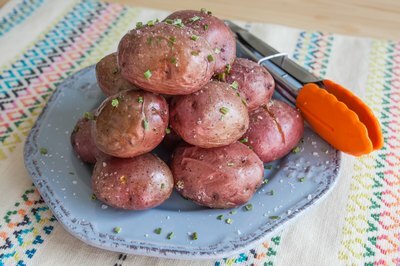 For a regular baked potato in a small package, obtain new potatoes or fingerling potatoes -- they're common, inexpensive and hold up well to high heat. For color and small size, try Purple Peruvian or Okinawa Blue, Adirondack Red or Kerr's Pink, to name a few common hued varieties. Heat the oven to 425 F. Poke the potatoes a few times with a fork and coat them with oil. Place them on a sheet pan and bake them until fork tender, about 30 minutes. For 15 to 20 minutes of total cooking time, microwave the potatoes on high for 2 minutes, turn them over and microwave another 2 minutes before you roast them. The restaurant method of par cooking potatoes produces best results, but takes the longest. It's only efficient if you're not already late putting the potatoes in the oven. 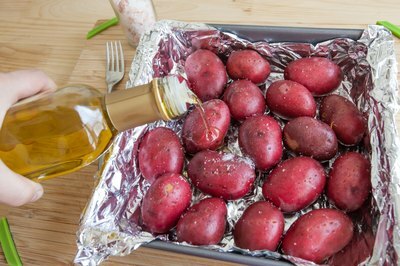 Heat the oven to 450 F. Coat the potatoes in olive oil, season them to taste and place them on a sheet pan or in a dish. Bake the potatoes for 30 minutes, lower the heat to 250 F and place a pot with about 1 inch of hot water in the bottom of the oven. The potatoes will be ready in 1 hour -- but stay fresh for another 2 hours. That's the advantage of the method.